Providing bulk food parcel, punjabi food pack for corporate offices etc. Our catering services involves the provision of food and beverages on a large scale to industrial / corporate catering services (canteen services) to various well-known organizations like software, BPO, manufacturing, pharma, food industries, institution etc. With a production facility able to produce a wide range of catering products for non-airline customers.In order to reduce any down time at the customer end, we are always ready to render timely attendance to their needs,requirements&quality. Now in this 14th year, we, “Amrut caterers”, are having a good experience in huge industrial sectors. When it comes to canteen food, then no one can compromise on the quality and hygienic of the food items. Hence, we prepare and offer a range of food products as a part of our canteen services. The types and quantity of canteen food items are decided by our customers We can serve the Best qualitative, fresh & hygienic food services 24x7 management systems as per the Industrial requirement at a most reasonable rate. We have the capability to serve 5000 or more people in an industry. We, “Amrut caterers”, involves the provision of food and beverages on a large scale to corporate catering services (canteen services) to various well-known organizations like software, BPO, manufacturing, pharma, food industries, institution etc. Be it an inquiry or an order, our responses is always rapid and precise. In order to reduce any down time at the customer end, we are always ready to render timely attendance to their needs & requirements. Brokering business deals, leading conferences, and hosting clients all demand perfection.” Amrut caterers” specializes in catering to cultural and ethnic preferences with impeccable execution and integrating last-minute changes seamlessly. And our menu development, décor coordination, and special requests fulfillment services allow us to match the style, need, and budget of all your events, no matter the occasion. The workforce recruited is trained to handle various tasks that are related to the day-to-day operations of the cafeteria / canteen and also to maintain proper hygiene. Our services that we provide includes breakfast, lunch, dinner, snacks and appetizers. “Amrut Caterers” deals in providing end-to-end institutional catering services to school & higher & further education sector across the state. We carry quality & excellent products to institutions relentlessly. The variety of products that we deliver include tea, coffee, breakfast, lunch, snacks & sandwiches, pizzas, chinese, continental, south Indian, fastfood & burgers, puffs, breads, tea time favorite recipes like biscuits, packaged snacks & toast etc. The products that we deliver are of different variety & freshness giving the students something to devour & enjoy. All our food items are healthy considering nutritional & dietary balance. The food items are decided & delivered by keeping in mind the client choice. We “Amrut Caterers” provide completely comprehensive outdoor catering services including various range of qualitative & delicious food for minimum 50 & maximum up to 300 people. Our excellence & perfection in the art of food makes us one of the profound providers of catering services for special occasions. 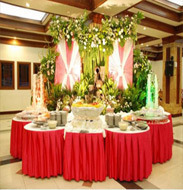 The services are thoughtfully tailored to suit clients’ preferred choice of menu settings. We are an integrated catering service provider providing a host of outdoor catering services for all functions such as weddings, corporate catering, gala party orders (Lunch & Dinner) or any festive occasion. Our full-range of outdoor catering services includes all aspects such as complete food preparation and presentation for formal as well as informal gatherings plus all the setup, cleanup, teardown & other as-requested amenities. With the guarantee of the pure & hygienic food, we strive to convert every special occasion into an event which will be remembered for a life time. If you are looking to organize a grand occasion with close friends or relatives or beloved ones, then the first thought that ponders into your mind is about the food. You may worry about the high prices of food and services but do not worry any further. At “Amrut Caterers”, we offer superlative catering service for a menu as par your choice to minimum 250 people & maximum up to 5000 or more at a reasonable rate. 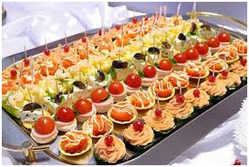 We offer catering services providing mouth watering delicacies and different varieties of cuisines. The taste and hygiene of all the cuisines are guaranteed by us. The entire menu (soup to desert) is prepared as per customer’s requirements under complete hygienic conditions. Our clients can also select various food items listed on our menus. Now in this 14th year, we are having a good experience in huge industrial sectors. When it comes to canteen food, we do not compromise with the quality and hygienic of the food items. Hence, we prepare and offer a range of food products as a part of our canteen services. The types and quantity of canteen food items are decided by our customers. We serve the best quality, fresh & hygienic food services 24x7 management systems as per the Industrial requirement at a most reasonable rate. We involve the provision of food and beverages on a large scale to corporate canteen services to various well-known organizations like software designing, research center, garment sector, financial firms, telecommunication, etc. Be it an inquiry or an order, our responses is always rapid and precise. In order to reduce any down time at the customer end, we are always ready to render timely attendance to their needs & requirements. We specialize in catering to cultural and ethnic preferences with impeccable execution and integrating last-minute changes seamlessly. And our menu development, décor coordination, and special requests fulfillment services allow us to match the style, need, and budget of all your events, no matter the occasion. The workforce recruited is trained to handle various tasks that are related to the day-to-day operations of the cafeteria / canteen and also to maintain proper hygiene. Our services that we provide include breakfast, lunch, dinner, snacks and appetizers. We provide completely comprehensive outdoor catering services including various range of qualitative & delicious food for outdoor catering. Our excellence & perfection in the art of food makes us one of the profound providers of catering services for special occasions. The services are thoughtfully tailored to suit clients’ preferred choice of menu settings. We are an integrated catering service provider providing a host of outdoor catering services for all functions such as weddings, corporate catering, gala party orders (Lunch & Dinner) or any festive occasion. Our full-range of outdoor catering services includes all aspects such as complete food preparation and presentation for formal as well as informal gatherings plus all the setup, cleanup, teardown & other as-requested amenities. With the guarantee of the pure & hygienic food, we strive to convert every special occasion into an event which will be remembered for a life time.